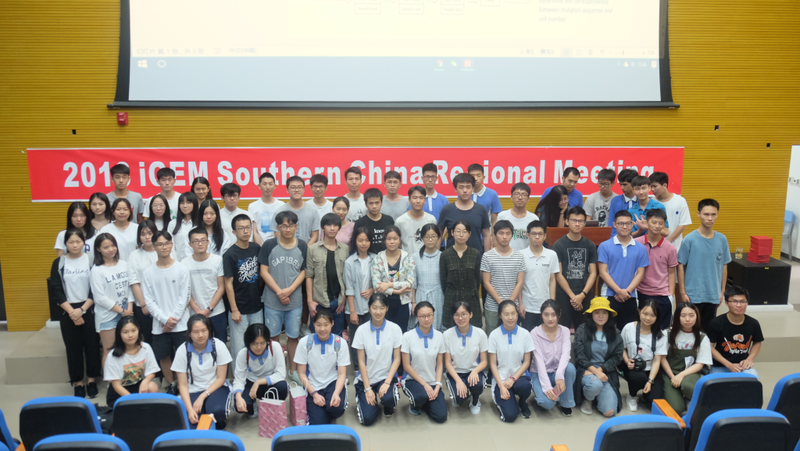 In the previous year, the SZU-China team held the 2017 iGEM South China Regional Conference at Shenzhen University. After sharing the ideas with each team, most of them found it helpful for their experiment designs and project improvements. With the experience and gains of the previous year, this year the SZU-China team continues to hold the meeting in the experiment preparation stage, hoping to gather ideas through the meeting and seek cooperation opportunities from each team. On May 6, 2018, we invited Sun Yat-Sen University, South China University of Technology B Team, Southern University of Science and Technology, Shenzhen Technician College, Shenzhen Middle School, Shenzhen High School, NPC High School and GBC team to our campus to have a meeting. During the meeting, each team shared their thoughts and answered the questions to whom was interested in their projects. After the presentations, all of us were welcomed to our canteen to have a lunch together. At lunch time, we met some new friends, had a deeper understanding of their projects and ideas. We also received the suggestions from other teams that made a great contribution to our later experiment. In addition, we set up a group chat during our meeting. In the group chat, we share our problems we meet and get plenty of solutions from them during the whole iGEM competition. We also set up some collaborations to some of the teams like SUSTech_Shenzhen and SSHS-Shenzhen that participated in our meeting. We gained a lot from this meeting. First of all, they pointed out that our project was not safe to other insects except cockroaches. Although the spores would not do harm to human, our spores could also infect beneficial insects or some insect pets. Therefore, we need to come out a better solution to kill cockroaches but not to infect other insects. Thanks to them, we finally found a great way to just kill the cockroaches and the spores would die if they spread away from our system in the late July. It was a great meeting that we could not only improve our project in time, but also make more friends that show great interest in synthetic biology the same as us. There were still many problems of our meeting this year, for example, the activities we arranged were so few that some of the attendees may get bored of it. We did an introspection and received their opinions after the meeting, and we are hoping that the meeting held next year would be more attractive and more teams would like to join us. On August 27, 2018, the iGEM team of Shenzhen University came to Shanghai University of Science and Technology in Shanghai to participate in the 5th CCIC Conference (The Fifth Conference of China IGEMER Community).We learn that we need to put more attention on our safey part and we also share our app to the other school. CCIC is currently the largest regional iGEMer exchange activity in the world. 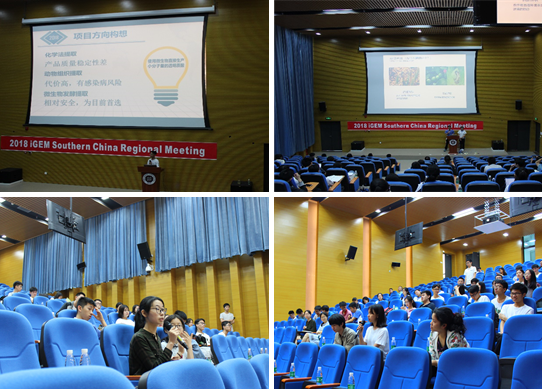 It is a non-profit academic exchange meeting initiated by iGEM students in China. It aims to build a platform for mutual learning and learning for the iGEM students in the Chinese competition area. In the past few sessions, the iGEM team of Shenzhen University has gained a lot of experience and cooperation opportunities from CCIC. This year our team also benefited a lot from CCIC meetings. The CCIC meeting ended on the 31st. The fifth CCIC just came to a close at the Shanghai University of Science and Technology. The CCIC Executive Committee said to Jamboree to all the teachers and students. I wish you all the best and enjoy an unforgettable iGEM. The end of CCIC indicates that this year's iGEM competition has entered the temporary time. Our team still needs a lot of content to improve and perfect. I hope that when you see Jamboree in October, you can show the world the perfect project of your team! From July 24, 2018 to July 26, 2018, the 2018 SZU-China team went to Shenzhen Yantian High School. During the three-day conference, we got feedback from other teams, including our need to pay attention to safety issues and experiments. Ethical issues. We learned a lot from the projects of other teams and the talks organized by the organizers, including how to make a good poster, do a good presentation, and do a good job in the team. More importantly, we make many new friends in this exchange, and we all hope that we can meet again in Boston for three days.